There is almost a million of them in Israel and in Jerusalem itself their population amounts to 100 thousand. They don’t recognize the state of Israel and at the same time they occupy seats in the parliament where they make radical decisions concerning the future of the country. They consciously separate themselves from the civilized world treating it as a pit of corruption. Who are we talking about? 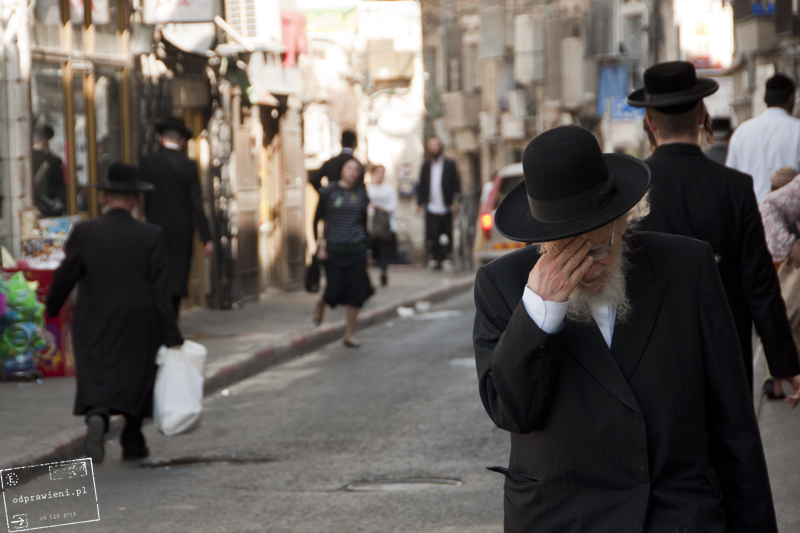 Haredim Hassidim, representatives of the most orthodox branch of Judaism. 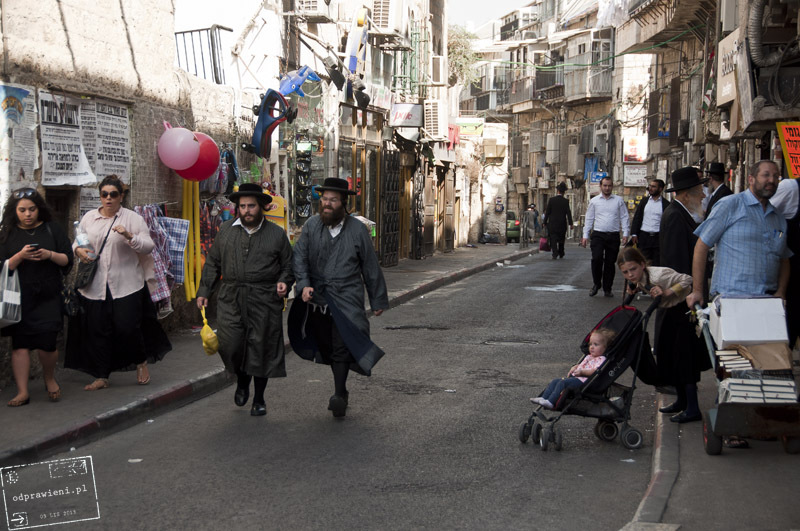 They have their own house in Jerusalem – Mea Shearim district, which is for me one of the top positions in the “must see” list, as far as that city is concerned. It’s a fascinating and a little terrifying topic. 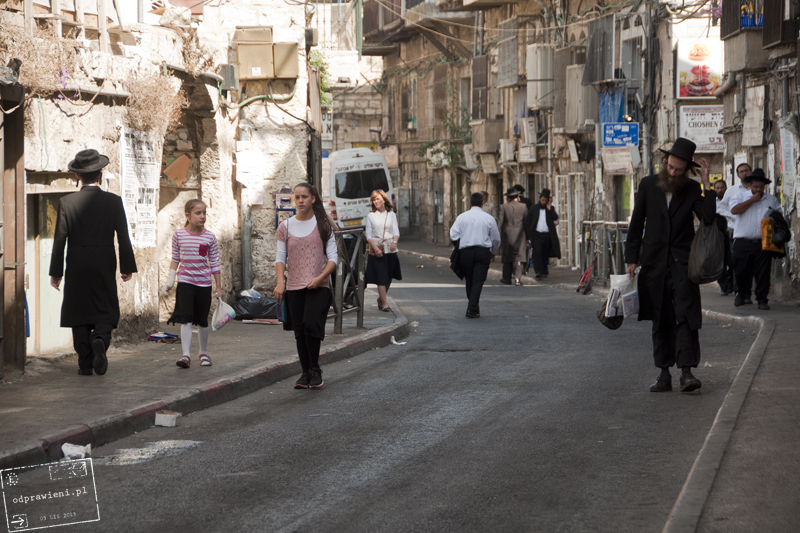 Mea Shearim district was founded in the late nineteenth century and since then nothing has changed there. 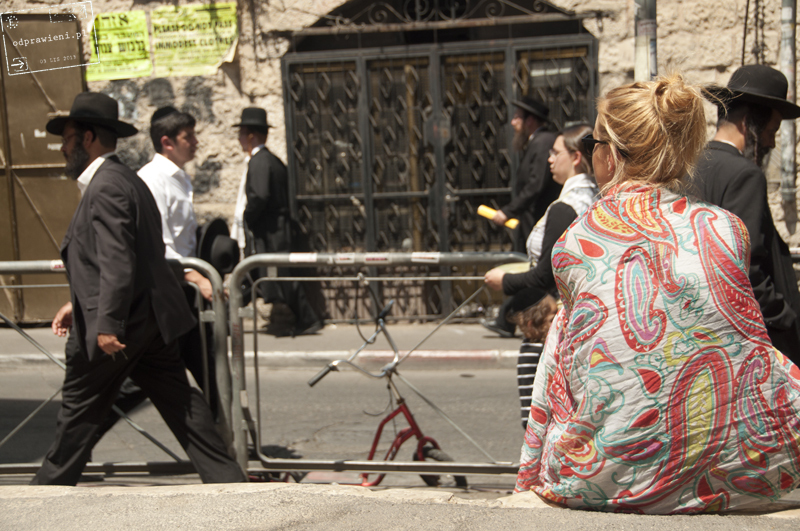 Tourist in Mea Shearim feels transparent, but in reality this transparency is an expression of slight ignorance. 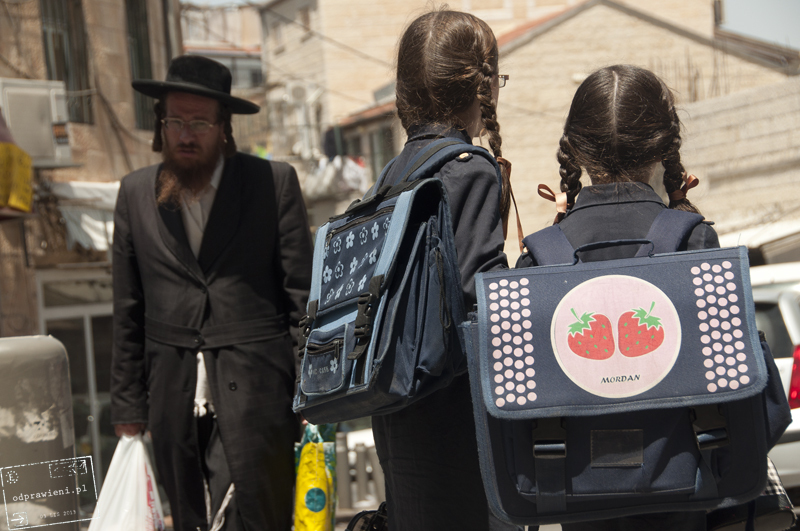 Children are everywhere… it is due to the enormous birthrate among Orthodox Jews. 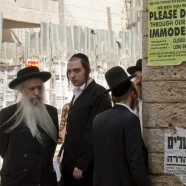 Hasidic Jews Haredim are often ringleaders who protests and riots in Jerusalem. Poverty increases frustration . 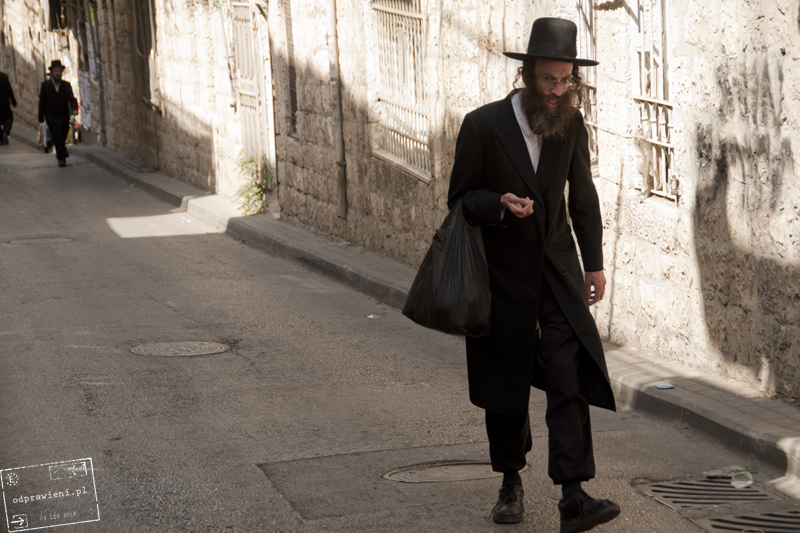 Majority of Haredim live below the poverty line. Large families make their living on social benefits granted to them by the state, which they don’t recognize after all… such a paradox. And there are in fact many of them to provide for by the state as procreation is strongly recommended in that community and contraception even more strongly stigmatized. 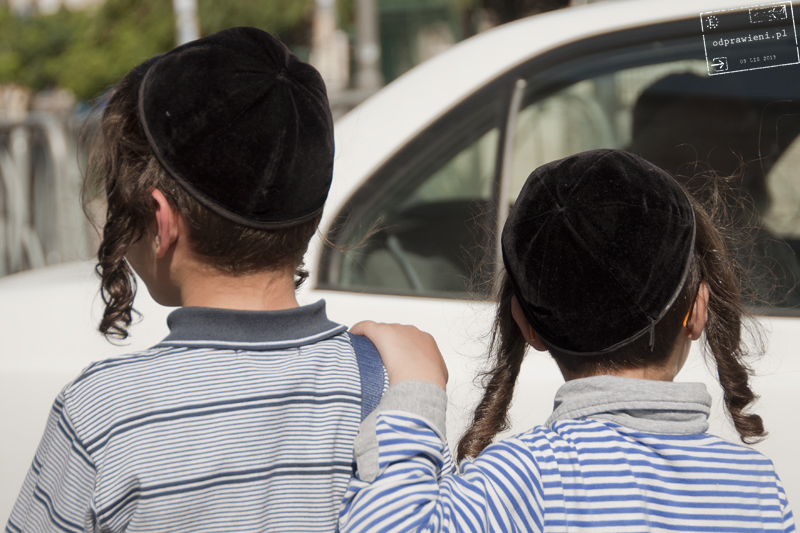 Hassidic families often have six, nine… eleven children. They form large families with a capital L. Most men in such orthodox families don’t work -they study Torah in order to develop spiritually. For how long do they study? The duration of studies is varied. Some of them spend on them five, some ten, others fifteen years… depending on the advancement level they desire to achieve. In that time the families get bigger and bigger and responsibility for the family rests on woman’s shoulders. Wives usually finish their education fairly early, what prevents them from taking up any occupation (for which they wouldn’t have time anyway!). Pashkevils (posters) warn against everything that could disrupt the traditional way of life. 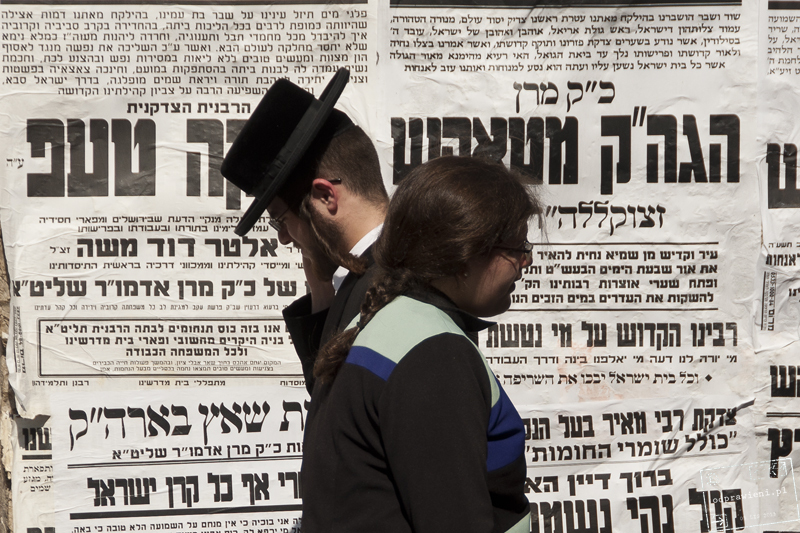 Haredim are so hermetic… they are in conflict even with the other branches of Judaism. Secular Jews are treated as unbelievers. 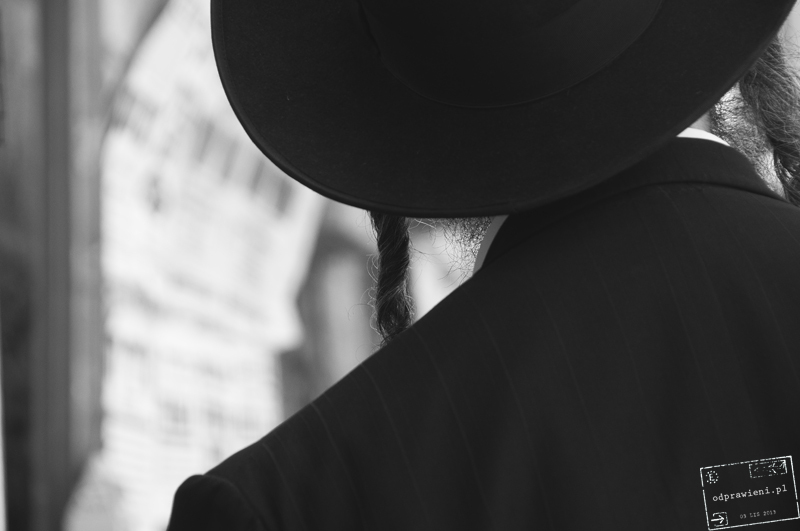 “Unusual” view – Orthodox Jew with child. 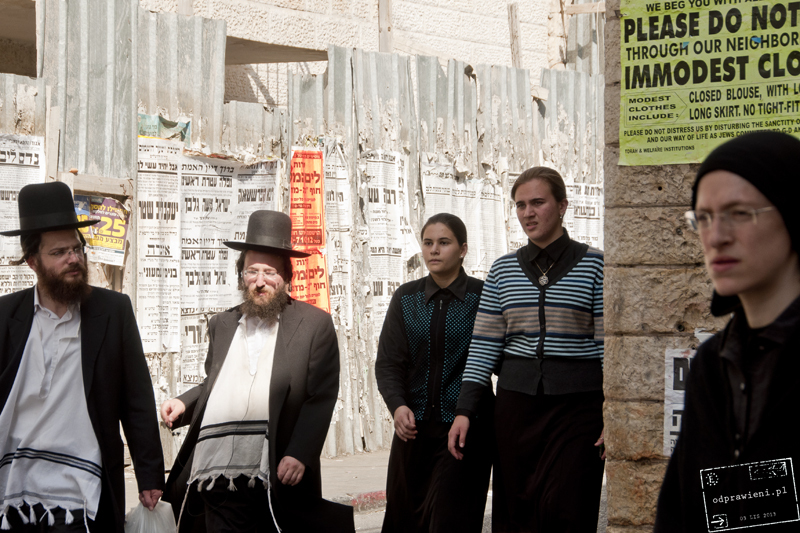 Mea Shearim makes a great impression, you’ll feel there as if you were on the set of a period movie, only the movie is being shot online … and everything is real. What hits the eyes of visitors, apart from the people, are the ubiquitous posters pasted to every wall in the district. They are the so-called pashkevils (interestingly, the Jews borrowed that word from Polish paszkwil).What is so important that it must decorate nearly every all neighbourhood? Things like information and warning to keep clear of the Internet, which is the source of all temptations and debauchery. If somebody have already been caught by the trap of the Internet, he should use the kosher Internet. Yes, there is something like that -it’s just a system with blocked websites or rather a search engine created especially to cater for these needs. The pashkevils in Mea Shearim simply warn or maybe remind the orthodox Jews to fight the temptations which await them on every corner! The warnings aren’t always polite -there is also a lot of aggression in them. 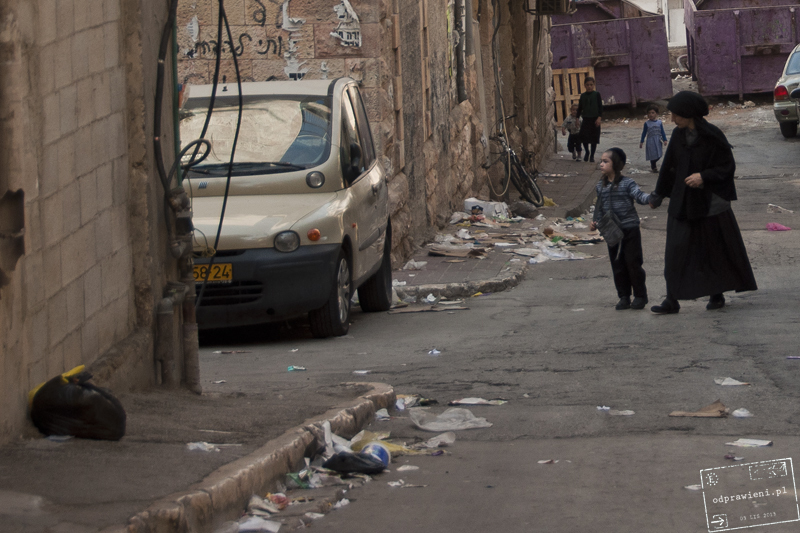 Poverty is visible and tangible in Mea Shearim. The streets are littered with rubbish and every few moments you may see a woman with a group of children holding fast to the pram pushed by the mother. 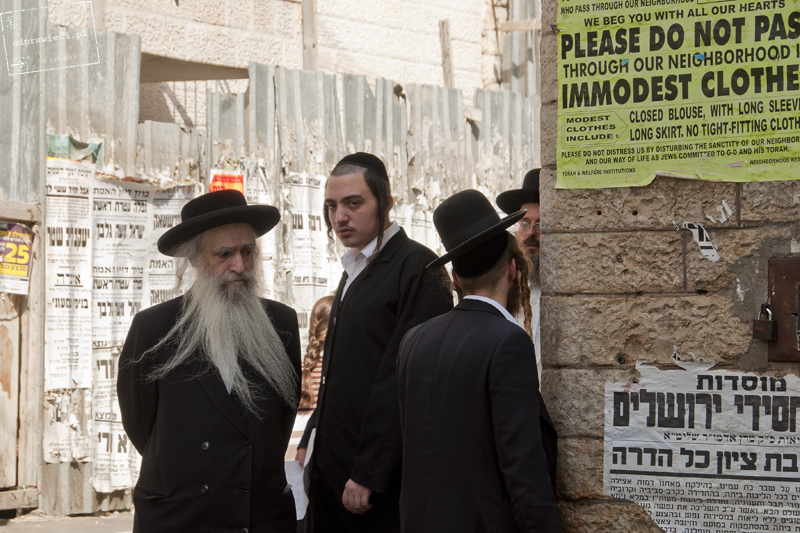 The Haredim live very modestly; they often inhabit extremely small flats. They obviously don’t have TV or the Internet and they often get food from the social assistance. The Israel is trying to help them as they form a significant part of the nation after all. Mea Shearim it is very photogenic place but not very friendly for photographers. You must remember to follow and respect the rules! Sidelocks. 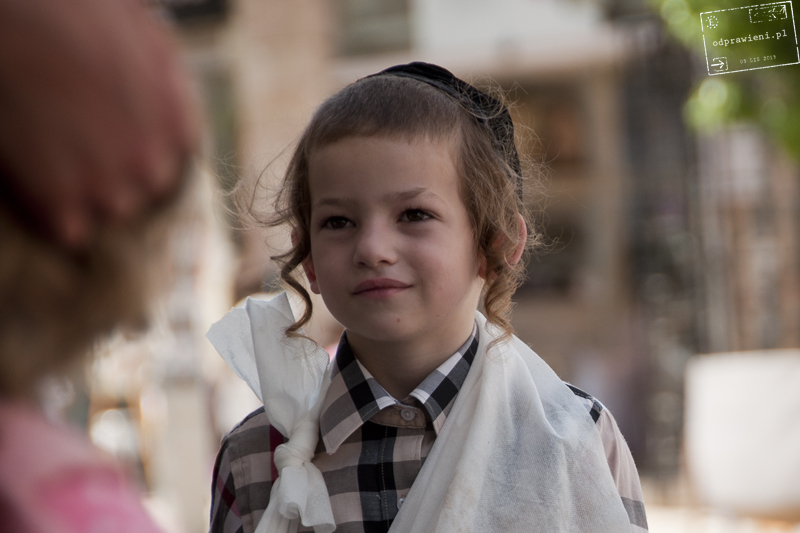 Real Hassid has sidelocks at the age of three years when the traditional ritual of cutting boys hair takes place. To sum up. 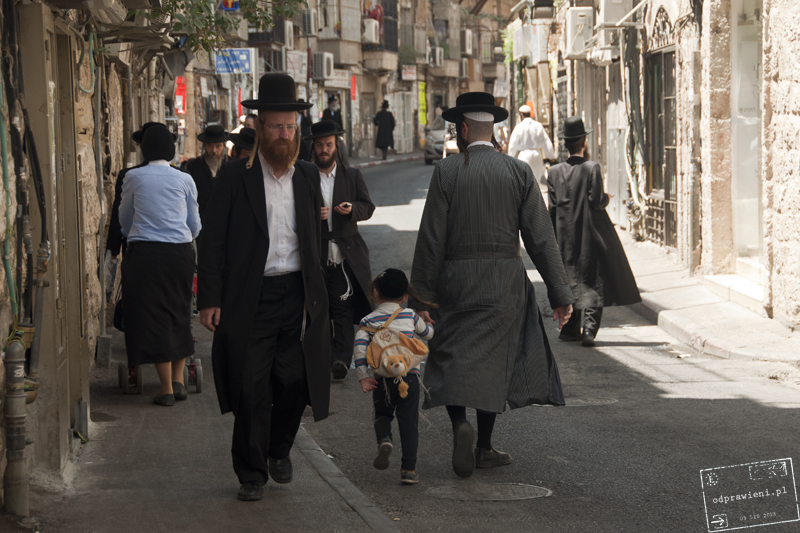 Visit Mea Shearim. We, people from liberal Europe, may not quite understand that place. We don’t have to agree with everything, but the place is really worth seeing and we must respect it!